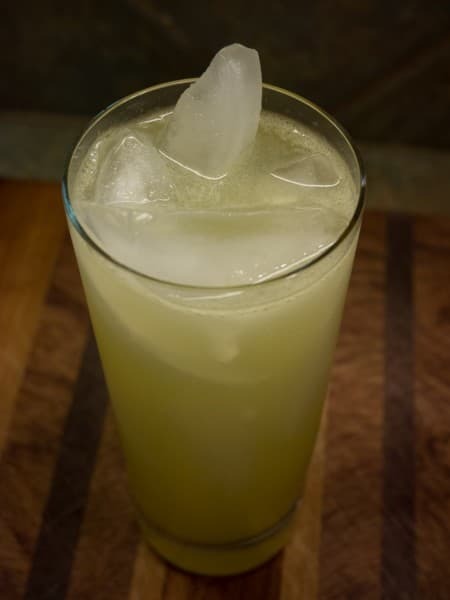 Shake the gin, orange juice and lime juice with ice cubes. Strain onto new ice in a highball glass. Top with ginger ale and garnish with a spent lime shell. I am not sure when the Orange Buck came into existence. The Gin Buck on which it is based dates back to the mid 19th Century. But orange juice in drinks is a newer phenomenon so I am guessing that the Orange Buck made it's appearance around the same time as another Buck built with OJ, the New Orleans Buck. This would be around the time of Prohibition when OJ and other juices were used to hide the crappy base spirits available then. Dry gin is prescribed in the recipe but this one might be interesting with Holland gin - the juices might play interestingly with the malty nature of the genever. I have had great results with Irish whickey (with it's similar malty characteristics) in punches with orange and lime. Next go around I shall try this.